Porsche's new DFI (Direct Fuel Injection) intake is a totally and completely redesigned intake system developed to deliver improved performance, fuel consumption and emissions by optimizing the air fuel mixture directly inside the combustion chamber. The DFI Porsche engine package is a finely tuned performance machine and additional power has proved difficult to find. The unique design of Porsche's new DFI intake system posed very challenging tuning hurdles but once again IPD developed a design that out performs the factory intake system without compromising reliability and drive-ability. 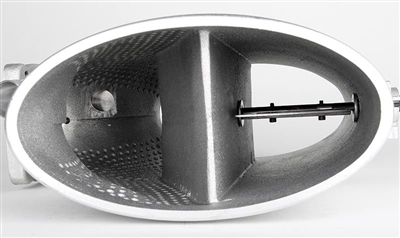 This innovative and revolutionary IPD DFI Intake Plenum employs the patented "Y" design as well as an enlarged plenum area that allows for improved intake air speed and air velocity resulting in performance increases without any power loses. The 987.2 Competition 82mm IPD Plenum requires the additional purchase of the 997 GT3 82mm TB. The IPD 987.2 Cayman "Competition" Plenum was designed to meet the needs of the most demanding Cayman S enthusiasts. The "Competition" Plenums is internally larger and specifically designed to utilized the larger 82mm 997 GT3 throttle body. This new 987.2 Competition Plenum follows in the foot steps of the very successful 987.1 Competition Plenum, which has proven itself to be the absolute single best performance mod that can be installed on any 987.1 application. The combination of the patented IPD "Y" designed Plenum and Porsche's largest TB yield great performance gains that can be seen and felt throughout the entire power band. The "Competition" version was designed and developed to work with Cayman S's equipped with high quality high-flow aftermarket cat-back exhausts. The addition of headers and high-flow cats will only further compliment the dramatic increases with intake air flow delivered by the IPD Plenum. Performance gains take place throughout both horsepower and torque curves but are most realized through the mid-range and well into peak power range. This system develops up to 20+ HP and 15+ Foot Pounds of Torque on Caymans already equipped with aftermarket cat-back exhausts. Once installed, the 987.2 Cayman Competition Plenum will truly transform your Porsche Cayman driving experience.